Collaboration between French and Japanese researchers resulted in the development of a three-dimensional "microvessel-on-a-chip" device for advancing the understanding of the processes that drive angiogenesis (production of new blood vessels). Elucidating the mechanisms underlying sprouting angiogenesis and permeability should enable the development of more effective therapies for various diseases, including retinopathy, cancer, and other vascular disorders. Sprouting angiogenesis was the first identified form of angiogenesis. It occurs in several well-characterized stages. First, biological signals known as angiogenic growth factors activate receptors on endothelial cells present in pre-existing blood vessels. Second, the activated endothelial cells begin to release proteases that degrade the basement membrane to allow endothelial cells to escape from the original (parent) vessel walls. 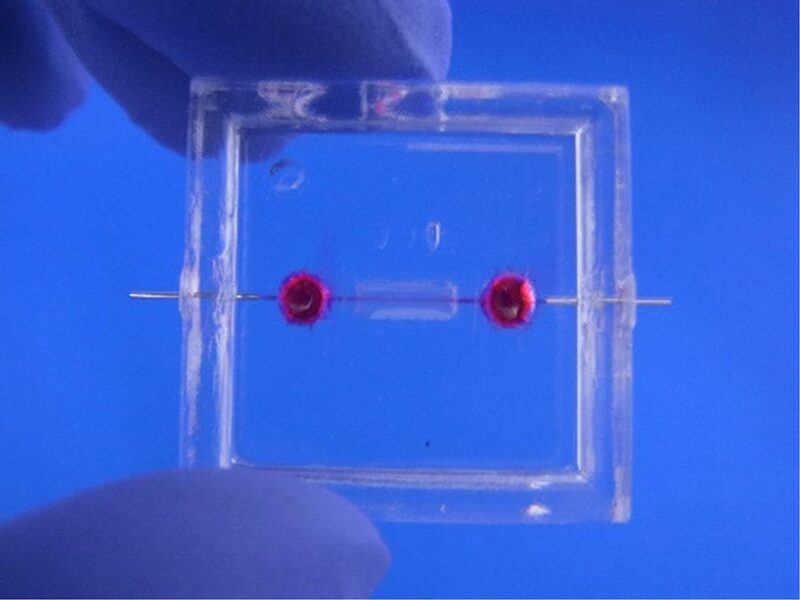 Image: The microvessel-on-a-chip used for angiogenesis research (Photo courtesy of Dr. Yukiko Matsunaga, Institute of Industrial Science, the University of Tokyo). The endothelial cells then proliferate into the surrounding matrix and form solid sprouts connecting neighboring vessels. As sprouts extend toward the source of the angiogenic stimulus, endothelial cells migrate in tandem, using adhesion molecules called integrins. These sprouts then form loops to become a full-fledged vessel lumen as cells migrate to the site of angiogenesis. Sprouting occurs at a rate of several millimeters per day, and enables new vessels to grow across gaps in the vasculature. Investigators at the Institute of Industrial Science of the University of Tokyo (Japan) and the French National Center for Scientific Research (Lille, France) focused on the protein EGFL7 (epidermal growth factor-like domain 7), which plays an important role in NOTCH signaling and in the organization of angiogenic sprouts. For this purpose they developed a three-dimensional EGFL7-knockdown in vitro microvessel model in order to investigate the effect of EGFL7 at a tissue level. The investigators reported in the March 2019 online edition of the journal Biomaterials that EGFL7 knockdown suppressed vascular endothelial growth factor A (VEGF-A)-induced sprouting angiogenesis accompanied by an overproduction of endothelial filopodia and reduced collagen IV deposition at the basal side of endothelial cells. They also observed impaired barrier function, which reflected an inflammatory condition. Furthermore, the results showed that proper formation of adherens junctions and phosphorylation of VE-cadherin was disturbed. "We obtained more insight into how blood vessels form by building our own in the lab from scratch, first forming a collagen mold containing a needle that was then removed, leaving a space that was then colonized by human umbilical vein endothelial cells," said senior author Dr. Yukiko T. Matsunaga, associate professor of biomedical engineering at the University of Tokyo. "We next examined the effects of EGFL7 by comparing two models of this type, one in which this molecule was allowed to function normally in these cells and another in which it was knocked down by siRNA."